Zappos is a free Windows 8 shopping app from Zappos.com. It enables you to shop right from your Windows 8 enabled devices. You have the independence to choose from a number of Brands and Products using this free Windows 8 shopping app. The available products are categorized as Shoes, Clothing, Bags, Accessories, and many others. Browse, Choose, and Buy from a number of coolest brands of the world. Right from the top flyout, you can get to a particular brand products. In the flyout, the brands are arranged in alphabetical order. The free Windows 8 shopping app allows you to buy from the available products, where you won’t have to pay for the first day shipping for the products you have bought. The app is present under the Shopping category in Windows Store. 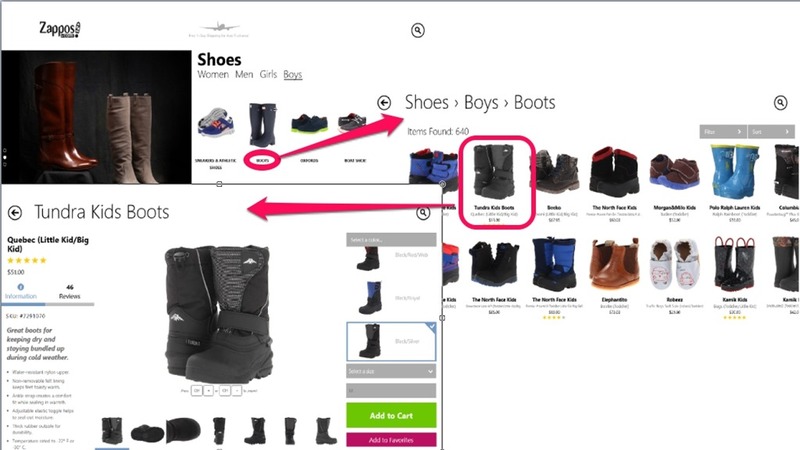 All the products available in Zappos store have been shown in high-quality images, with different angles within this free Windows 8 shopping app. You can get a better idea about the the product from the Detailed Images available here which can be zoomed. Even there is a functionality to keep a track of recently viewed products. Also, if you have registered account with Amazon.com, you can even add products to your Favorite list. 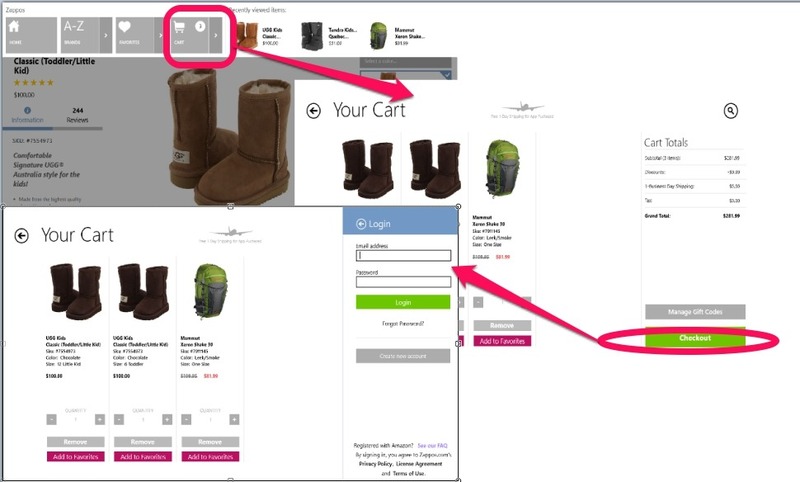 Let’s get you a better idea about this Windows 8 shopping app. 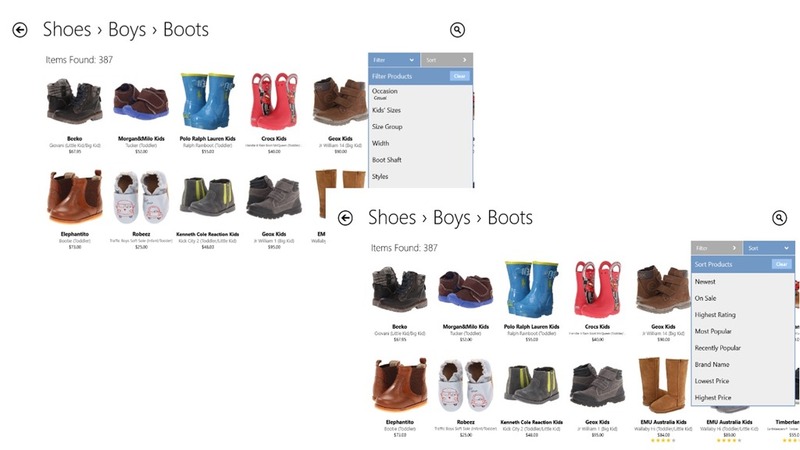 Right on the main screen of this free Windows 8 Zappos app, there are categories like Shoes, Clothing, Bags, Accessories, and more. Within these categories, there are a number of sub-categories available like Men, Women, Boys, and Girls. Go to any sub-category and you would get all related products. Now whenever you choose a particular item in this free Windows 8 shopping app, you would be provided with the layout, Information, and Reviews for that product. These things may be more helpful for you to get a better idea of the product. To shop a particular product, you can select the color you want, select the size, and add it to your cart . Now, in order to complete the order, you have to get to the cart. The cart option is available in the flyout of the app. From the cart, click Checkout button, and then you have to provide your Amazon.com Credentials to make the final payment. There is also an ability that the user can even add products to his Favorites list. This feature again requires you to login with your Amazon.com credentials. Zappos gives you the ability to filter your results more effectively. For that just choose your sub-category from the available categories. When you choose an option from the sub-category, you will be taken to the product’s screen. From there you can filter your results. In order to filter your results, you have to choose from the given options in the Filter Dropdown. But just by choosing a particular option, filtered results won’t appear. For that, just click anywhere outside that dropdown list after choosing the required option. You can also use the sorting option to better manage your results. Here you can choose to view products on the basis of things like Popularity of the products, Prices, Brand Names, and others like that. Check other shopping apps reviewed earlier by us: Amazon, eBay. Free availability: The app can be availed freely from the Shopping section of the Windows store. Nice User Interface: The interface of this Windows 8 Zappos app is quite nice. You can easily understand the working of the app. Shop from a large Database: The Database of this free Windows 8 shopping app is quite large. Choose from a wide variety of products. Choose from renowned brands: Products are available from world renowned brands like Hush Puppies, Levis, Adidas, and many others. You can choose from numerous brands. See detailed images and see the reviews for a particular product. Keep list of your recently viewed products. Add products to your Favorite List. Free one day shipping: The app provides the user with free shipping for one Business Day. I used the app and would say that the app is quite nice. The interface of the app is quite good. I was able to figure out my way right on my first use. You can buy from a large database of products. 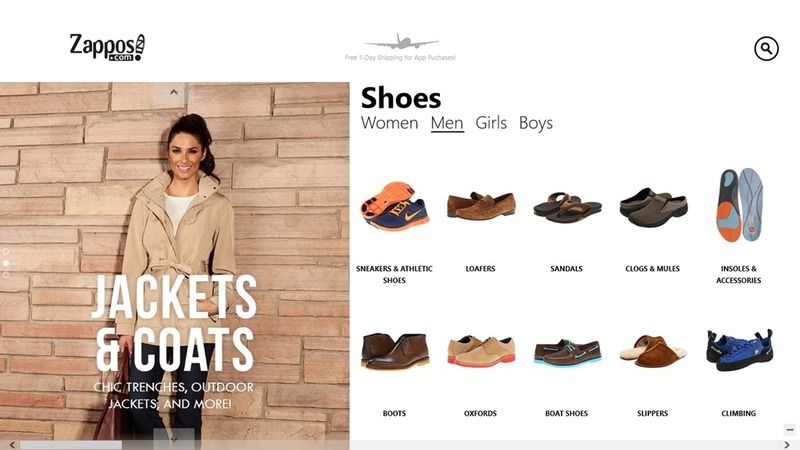 Plus that, this Windows 8 Zappos app provides you the ability to choose from a vast number of world renowned product Brands. All in all, the app is worth a try.